If the deal goes through, Alibaba, Tencent and Toutiao will be respectively backing the top 3 news aggregators in India, UC News, NewsDog and Daily Hunt. Tencent is exploring opportunities in a US$30 to 40 million investment in India’s news and entertainment content aggregator NewsDog, according to India’s business and financial website Live Mint, citing sources familiar with the matter. The Chinese tech mogul behind the super app WeChat has previously invested in India’s internet firms including Flipkart, Ola and Practo. According to Live Mint’s sources, the Shenzhen-based company “has identified NewsDog as an attractive bet”. 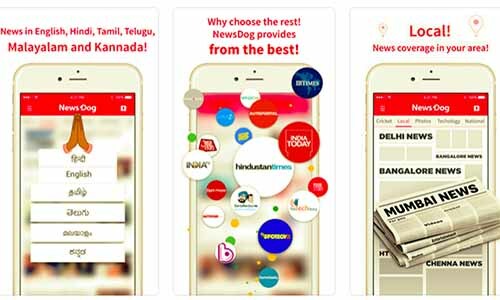 Founded in 2016 by ex-Baidu employee CHEN Yukun, Newsdogg successfully launched itself into the top 3 news aggregator in India, competing against Alibaba’s UC News and local app Daily Hunt, which was invested by Toutiao. NewsDog’s slogan “news just for you”, speaks to its core idea, which is to deliver big data analysis-enabled personalized contents to each different user. Image credit to App Store. The startup has 10 million monthly active users who spend on average 30 minutes daily on the platform, CHEN said in an interview last October. Around 60%-70% of users are Hindi language speaker, 20% English and the rest other languages. CHEN contributes the quick acceptance by the local market to the company’s localization strategy. In addition to English news, the aggregator provides content in 10 local languages, including Hindi, Tamil, Telugu, Malayalam and Kannada. In China, Toutiao is undoubtedly the No.1 of its kind. However, in India, the battle for a dominant role just got started. CHEN thinks the major challenge for NewsDog is copyright. August 2016, NewsDog was on the verge of being removed from Google Play as a media outlet claimed its content was unwittingly taken by NewsDog. The problem was solved after negotiations with Google and the media outlet and NewsDog later launched a self-media platform to encourage user-generated content so as to avoid the same copyright pitfall. If the deal goes through, it means that China’s three tech giants, Alibaba, Tencent and Toutiao, through local services or allies, are slated to repeat their vehement competition in news distribution in a remote battleground outside their home turf.